The final regional workshop in France was organised on 24 March, 2017 in Pessac, Aquitaine. 10 people representing ADEME, cooperatives (agricultural and forest) and municipalities attended this regional workshop. 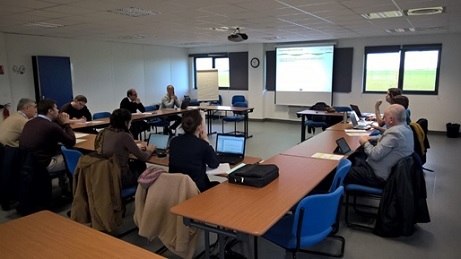 Services Coop de France presented SUCELLOG project concept and objectives, project partners and results achieved during the 3 years of project implementation. Different published materials (handbooks, guidelines, reports) and various opportunities offered by the project have been presented. In addition to that, the main barriers and actions to overcome them have been discussed. During the workshop the also the case study of Luzéal was presented by UCFF and the workshop was concluded by the presentation of ADEME about the status of biomass and agricultural residues in the region. The fifth regional workshop in Spain was organised on 20 January, 2017 in Mérida (Badajoz), Extremadura. The workshop has been organized by Agro-food Cooperatives of Extremadura and took place in the facilities of the Agro-food Cooperatives. 18 participants representing olive and oil olive sector attended this workshop. SUCELLOG project and the results achieved during the project lifetime in Extremadura region were presented. Biomass potential studies related to the locations of existing agro-industries, and the results of audit and feasibility study of Troil Vegas Altas have been explained in details. The forth regional workshop in Spain took place on 20 January, 2017. It was organized by Agro-food Cooperatives of Aragon in Sala Grande Covián, Edificio Centrorigen, Mercazaragoza in Zaragoza. 20 participants representing agro-food Cooperatives of Aragón region, agro-food sector, boiler and burner manufacturers, potential biomass consumers, researchers, energy sector experts and policy makers attended this workshop. Carlos Ayerbe Gracia, APISA S.L. Regional workshop of the SUCELLOG project has been organised in Paris by UCFF and Services Coop de France on 28th of November, 2016. The aim of this workshop was to disseminate the results of the SUCELLOG project and to initiate comprehensive discussion on the production of agro-pellets. 15 people representing policy makers, cooperatives, boiler manufacturers, ESCOs and laboratories attended the workshop. On 17th of November, 2016 Coopenergie organized a regional dissemination workshop of the SUCELLOG project in Roye (Picardy). The aim of this workshop was to disseminate the technical results of the project and to initiate a large debate on the production of agro-pellets in a restrictive economic period. The workshop involved 12 participants representing SUCELLOG cooperation partners and agrarian cooperatives. Invitation to the workshop (only in French) is available HERE. 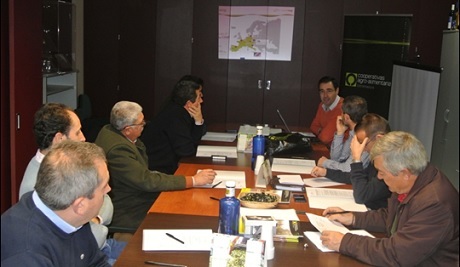 The regional workshop of Castilla León, organized by URCACYL (Regional Union of Agricultural Cooperatives of Castile and Leon) in Valladolid, served as a platform for dissemination of the progress achieved by the partners of the participating countries. On the other hand, this meeting was used for offering advisory services to the stakeholders, to detect non technical barriers and discuss them with policy makers. Workshop participants included boiler manufacturer company and a representative from the regional administration. Additional dissemination workshop in Austria was organised on 13 October, 2016 in Vienna in the Austrian Chamber of Agriculture and Forestry. 13 Energy experts from all regions of Austria took part at the workshop. In this event all relevant new topics in the field of energy were discussed as well, as the ongoing activities within the SUCELLOG project. Lk-Stmk presented the results of the feasibility studies and of the audits carried out during SUCELLOG project activities in Austria. 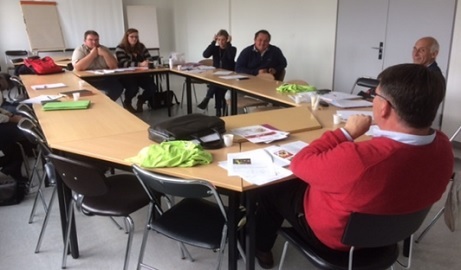 Eight professionals representing biomass sector were working together in Saint-Etienne du Rouvray during the “Ecotechnologies days” to share their thoughts about production and use of agro-pellets and their development opportunities at the regional and national level. Associations, companies specialized in biomass, and representatives from research institutions were working with Coopenergy to address the issues of agro-pellets sector. Regional workshop in Catalonia took place in Lleida within the 62nd Agricultural Fair of San Miguel. It has been organized by the Federation of Agricultural Cooperatives of Catalonia. Spanish Cooperatives presented SUCELLOG project and initiated discussions on non-technical barriers for the implementation of project concept in Catalonia. The workshop for the Auvergne region has been organized during the event dedicated to biogas, periodically organised by Coop de France Rhône-Alpes Auvergne. The session was split in three parts: presentation and feedback about biomass from each participant, discussion about the added value of anaerobic digestion and discussion about the use of solid biomass for energy, developing mainly the competitive uses between solid biomass for combustion or using it as feedstock for biogas production. 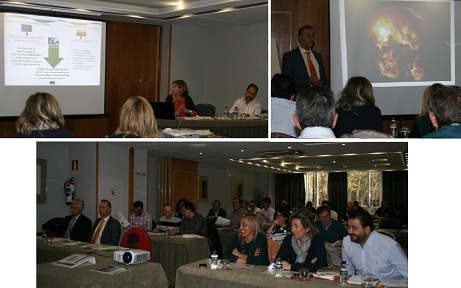 Regional workshop in Galicia has been organised by AGACA - Asociación Galega de Cooperativas Agroalimentarias. SUCELLOG project has been presented, providing an overview of the concept, main goals and results of the regional potential study. 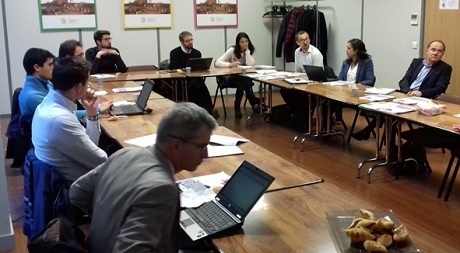 The presentation was followed by a roundtable discussion with policy makers, addressing the non-technical barriers for the implementation of SUCELLOG concept in Galicia region. 24 participants representing agricultural cooperatives, technical biomass experts and regional government attended the workshop. 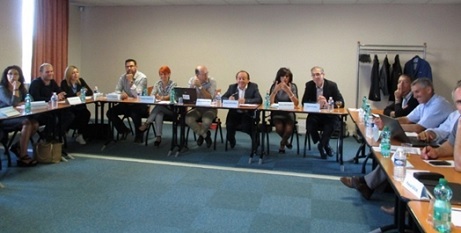 27 people representing SUCELLOG cooperation partners, cooperatives and community of municipalities of Auvergne Rhône Alpes, national and regional institutions, boiler manufacturers and professional unions participated on the workshop organized by Coop de France Rhône-Alpes Auvergne. The workshop included presentation of SUCELLOG project and the results of 5 feasibility studies. Regional workshop has been organised by the Chamber of Agriculture and Forestry in Carinthia. 31 participants – members of agrarian associations and agrarian experts attended this workshop. Discussions after the presentations showed that there is an interest in SUCELLOG project concept; however, a technical advance in the current heating systems will be needed to provide better opportunities for using crop residues as fuel in the future. 23 participants – agrarian experts, farmers, biogas plant operators, CHP-operators, district heating plants operators – attended the regional workshop organised in by the Biomass Association of Upper Austria. The event was opened with the presentation of the SUCELLOG and the current status of the project activities in the region. After the presentation the floor has been opened to discussions. Organisation of the regional workshop in Styria was supported by the Styrian Association of pumpkinseeds and oil. The workshop was targeted to agrarian associations and biomass producers in south-east and south Styria. 10 people participated on the event. The concept of the SUCELLOG project and ongoing activities has been presented. Participants were highly interested in finding new solutions for the development of the region. On 16th of April, 2016 in Orsara di Puglia (FG) a SUCELLOG project workshop has been organised on the occasion of inauguration of the headquarters of cooperative ING.FOR.ECO. 28 people attended the event organized by D.R.E.Am. Italia in collaboration with ING.FOR.ECO. The event has been focusing on the opportunities for SMEs/Cooperatives to participate in European funding programmes. SUCELLOG was presented as project example supported by European funding. During the workshop the results of the diagnosis made in Puglia and in the other Italian regions were presented. The workshop has been concluded with a discussion on main non-technical barriers, specifically related to Puglia region. On 5th of April, 2016 in Empoli (FI) the Agenzia per lo Sviluppo dell'Empolese-Valdelsa (ASEV) and D.R.E.Am. Italia a SUCELLOG project workshop was organised. The event was focusing on the opportunities for SMEs/Cooperatives to participate in European funding programmes. SUCELLOG was presented as project example supported by European funding. During the workshop the project was presented and in particular, results of the diagnosis on 20 farms or agro-industries throughout Italy were discussed. Presentation highlighted important issues which has to be considered in order to build a logistics center for biomass, and difficulties and the technical, economic and non- technical barriers were discussed with participating agro-industries and policy makers. 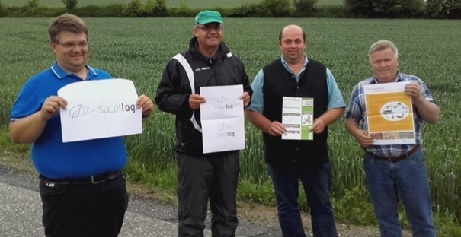 Regional workshop in Lower Austria has been organised in cooperation with the Biowärmeverband Niederösterreich and was targeted to agrarian associations, biomass producers, biomass-users, national administration and planners. In total 35 people participated on the event. on December 2015 the 10th, in Oristano (Sardinia), a Regional Workshop of the SUCELLOG Project was carried out, during a meeting of Sardinian cooperatives of Legacoop. During the meeting the project and its activities were shown. In particular, the agricultural and agri-food cooperatives interest on the service of diagnosis and auditing to become a logistics centre for the production of biomass from agricultural residues was evaluated.